Routes: SeaDream II sails the Mediterranean from May to October and the Caribbean from November to April. Well-traveled sophisticates who like less-trodden itineraries, refined service, and socializing with other passengers; couples looking for romance. Anyone who might feel stir-crazy on a small ship with few entertainment and dining options; families who need supervised or structured children’s activities. The service — friendly, attentive, and unpretentious — merits its reputation. Each sailing culminates in a nine-course dinner. Sleeping under the stars in the top-deck Balinese beds offers guests a unique, romantic experience. Some say size is everything, and aboard the SeaDream II, that’s a statement that rings true. It’s an intimate ship — one of two in SeaDream Yacht Club’s fleet — holding a mere 112 passengers, a fact that shapes every facet of each cruise. The result: You won’t have big production shows to watch each night or a zip line to hang from, but neither will you have crowded pool decks or interminable buffet lines. Waiting — for a tender or a seat at dinner — is hardly a concept on this ship, or if it is, you’ll be the one being waited on. The service is some of the best in the industry and easily makes the cruise. Raise your hand in the hot tub, and a glass of Champagne will appear. And if the chef doesn’t have the ingredients for your favorite dish, he’ll make a special trip to get them. Itineraries weave in less-frequented ports — such as Sanary-sur-Mer in France and Les Saintes in the Caribbean — which translates into a more intimate experience on shore, as well as on the ship. Drinks are included in the fare, with the exception of premium liquors and wines. So although the base price may create sticker shock, there’s little else that you’ll need to shell out for while onboard, apart from Wi-Fi and shore excursions. 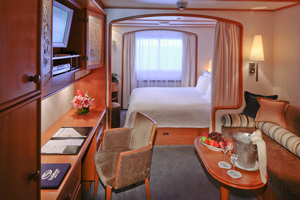 SeaDream II doesn’t have many cabin categories, which makes choosing a stateroom a no-brainer. There are no inside cabins, but no balconies either. Most of the rooms are Yacht Club staterooms, the ship’s so-called standard cabins, but they’re above par at 195 square feet. The rooms have a nautical theme (brass clocks, striped pillows, atlases in glass-enclosed shelves), which looks more classic than contemporary. A curtain divides the bedroom and living room, giving the cabin dimension, while bathrooms are clad in Italian marble and come with jet-spray showers and Bvlgari products. Other amenities include embroidered pajamas, a complimentary minibar, a flat-screen TV with DVD player, and a (dated) iPod® docking station. Those who need more space can opt for a commodore suite (two adjacent Yacht Club staterooms put together, minus a second bed), or the more decadent admiral suite or owner’s suite, both comparable to the size of a city apartment. These specialty cabins all feature additional bathrooms, more windows, and multiple TV sets. The admiral and owner’s suites have the additional benefit of Nespresso® machines and soaking tubs. 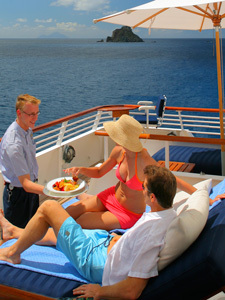 Though SeaDream II doesn’t have a dizzying roster of specialty restaurants, you won’t crave options. 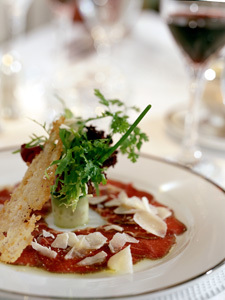 Meals are served in two venues: indoors at the Dining Salon and alfresco at the Topside Restaurant. Breakfast is worth rolling out of bed for: brioches and croissants, pancakes and French toast, freshly squeezed juices, and vegetable juice shots. The type of offerings don’t differ much from other cruise lines, but SeaDream shines in the quality of ingredients and execution. The sign of a skilled chef: a perfect omelet (in my case, studded with wild mushrooms and herbs), cooked until fluffy and moist with not a hint of either runniness or dryness. On port days, many guests return to the ship at lunchtime to refuel. It’s a meal that’s as light or as hearty as you want it to be. You can mix and match a soup of the day, made-to-order items (lasagna, veggie burgers), a buffet of cold salads (shrimp and avocado, beef and pickles), and desserts (chocolate eclairs shaped like swans). Every evening, the ship has a “yacht casual” dress code, and dinner is an elegant, five-course affair served with a choice of a red or white house wine, which changes daily. Dishes are delicate with savory choices such as warm crab claws or a foie gras terrine. Then come light soups or salads (hearts of palm, spiced lentil) and palate cleansers (pomegranate sorbet, coconut frozen yogurt) before the entree, which, because of the portions, never feels too heavy. Choices often vary according to the port; for my Mediterranean sailing, there was an Italian theme night that featured a caprese salad and a flavorful tuna steak served with braised zucchini and olive salsa. Just when you think you’ve had enough, dessert arrives, with choices such as chocolate fondant and strawberry pavlova. The finale: a tray of petit fours and, if you wish, a snifter of complimentary house cognac or a custom-blended exotic tea. SeaDream II also has wellness options and a raw food menu with items (such as beet ravioli with pine nut cheese) you actually wouldn’t mind chewing and swallowing. Also of note: The chef is from New Delhi and whips up some Asian dishes (lobster masala, potato curry) that will satisfy anyone’s craving for spice and something more authentic than what’s typically toned down for the cruise crowd. The waiters are the kind of men you’d want to bring home to your mother: They’ll lend women an arm when escorting them to their tables, place napkins in their laps, and tell them that they look beautiful. They’ll also carry your buffet choices to where you’re sitting, crack sometimes-funny jokes, and — without raising an eyebrow — enable your caffeine addiction with refill after refill of cappuccino. When there are misses, say if your Dover sole was overcooked or that strawberry-black olive dessert didn’t work for you, they’ll kindly offer a replacement. Tip: The chef is always up for a challenge, so feel free to make special requests. For example, on my sailing, one guest asked for jalebi, a popular Indian street food made of rings of deep fried wheat flour coated in sugar syrup. SeaDream II’s itineraries are port-intensive, so daylight hours are dedicated to exploration ashore. 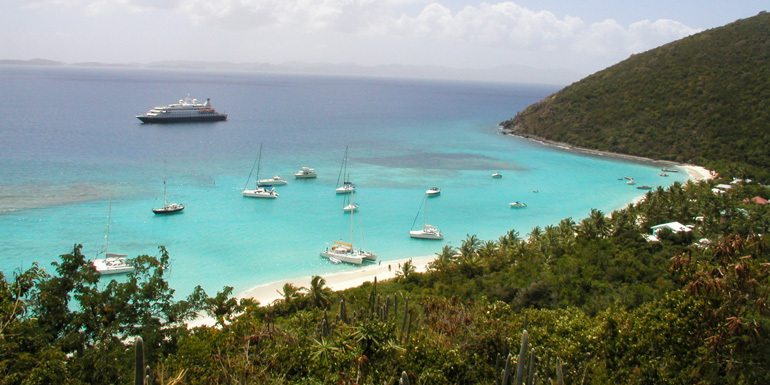 A fleet of mountain bikes keeps guests out and about, and the ship organizes outings with crew members, such as market visits in St. Tropez and beach hikes in St. Bart’s that are included in the fare (in addition to the for-a-fee classic shore excursions). On clear days (on my sailing: sadly, none), guests can snorkel, paddleboard, or water ski off a marina platform, lounge on an inflatable island, sail a catamaran, or paddle a glass-bottom kayak. Relaxation is key among guests, and there’s a quiet library with a computer station and thumbed-through tomes. The pool deck is located at the aft of the ship, attended by a staff member who will offer to shine your sunglasses or serve a glass of Champagne in the hot tub. Few pay a visit to the golf simulators on Deck 6, which also holds a set of Balinese beds that guests can reserve at night to sleep under the stars. The spa, with its small but never crowded fitness center, is great after a long day of sightseeing. SeaDream runs its own facility with a special focus on Thai therapies (think jasmine-scented body scrubs and outdoor Thai massages). Because the sales approach is not as aggressive as at Steiner-managed spas, your massage can actually be relaxing. While this isn’t a Carnival Cruise Lines-style cruise with hairy chest contests, raunchy comedians, or flashy stage shows, you can still have fun. The single-table casino and modest piano bar may seem inadequate at first, but they’re more than sufficient when you realize that onboard entertainment centers around conversations over rounds of Champagne cocktails and off-key renditions of “YMCA” and “Dancing Queen.” Depending on the evening, bartenders can shake up cocktails for you in the Main Salon or at the outdoor Top of the Yacht Bar. The highlight of the week: a festive party with live music on the pool deck. Nespresso is a registered trademark of Societe des Produits Nestlé S.A.
What do you like about SeaDream II?